Could you please remove it from Rat Loot Drop tables please, because this is getting rather annoying having them now in my hangar. but attempt to autolink it, and "Your query returned no legitimate item types. Please try again." Ever since the first iteration of this patch the EVE Launcher keeps, occasionally, generating an 'Error - Version Info Not Available'. The upshot seems to be that the account 'start' button disappears - and the only option is to close and restart and re-enter all the password details. It's very annoying. Sometimes it will fix itself - but not often. So I can imagine you are somewhat proud of your work but can we have an ETA when you fix the d-scan staying closed every time you undock any time soon? It is very annoying that you have to open your probe scanner and d-scan every time you undock. That "pin" button was supposed to keep the windows you like pinned onto one position, not close them! To your "brute force the new d-scan on everyone method" I raise you to I have OCD. Not sure if this is an issue related to this patch or just an existing issue. One of my accounts dropped to Alpha overnight. I logged in, plexed it and now although it shows as Omega I am unable to fly at least one of my ships due to lack of CPU. It seems when you upgrade from Alpha to Omega your implants aren't included in the upgrade. I use CA's for the extra CPU and cap on a particular fit but can't fly it now because I don't have enough CPU and my cap life is reduced by 1 min 50 seconds (it isn't counting my implants). Also in spite of the ability to have 5 jump clones, I have 3 installed but am unable to install another as "you have exceeded your limit". My alt-d is wearing out. Haven't seen a patch note that directly addresses this problem, but since yesterday's patch the Orca ice drone has not gone idle when it shouldn't. That patch included a fix for an ice/ore harvesting problem with strip miners/ice harvesters, but, who knows, maybe that fixed the drone problem too. To clarify (for me) this is the old scanner. Not the new aids infested one. GIVE US AN ANSWER ON THIS CCCCCCP. There's been a little patch or two....today. ****2nd Update - 3 corrupt files in my cache it seems. Can log in now. Having the same problem as this guy, except clearing the cache doesn't seem to work for me. EBR-115982 - Issues with Overview position resetting after every login ( Overview is moving ~10 pixels off the upper right hand location where it was originally docked) - EBR was closed stating could not be reproduced so closed by bug hunting team. Can repo this on multiple accounts. Another UI issue being experienced is that my chat windows docked at the neocom will become unstuck from their position with autohide turned off. If I alt tab to another client window while moused over the chat box it appears to become disconnected from the neocom and left floating in the original position with the neocom was exposed. -) during hacking the computer starts running hot, very hot, the fan blows at max speed and the cpu goes to 180%, some seconds later the computer reduces processing speed and the game comes to slo-mo speed - roughly 3-5 sec response time after clicking a single hacking node is usual. what is running there in the background that consumes that much cpu? thx for fixing these problems soon! What is your frame rate like during these periods? I saw mine go to nearly half of normal for the duration of the hacking minigame then go back to normal. Sorry, I do not display frame rates. The reduction in computer response is so drastic, for sure, much more than 50%. I guess (no measurement) the performance is dropping to less than 5% during hacking mini-game. However, it has some dynamics: the first few nodes respond quickly while the cpu-fan is taking up speed. Roughly 15-20 seconds later the fan blows out hot air and processing speed drops down to a crawl. Clicking a node results in 3-5 seconds delay until a response. You can imagine how exciting that is? In comparison: Once I took part in a battle with 1500 ships on grid. The fight situation did not keep my computer that busy as the hacking mini-game does! Sounds like you're running into similar issues to me and a friend. I'd suggest submitting a support request and making it attn: CCP Paradox. He was looking into the issues and the more cases of oddities during the hacking minigame the better. Im having the issue with the ui thinking that I am holding down shift. I am trying to move the camera around, but the game thinks I am holding down shift, trying to lock multiple items. Dragging a box around items. So something is going on with the Total Net Worth calculator. This is not just my implants it's discarding. Linking issue from General feedback thread to issues Thread. Note: When first logging in and undocking from a citadel this issue occurs, any other subsequent undocking after correcting the window positioning will not encounter this issue. This has been on going on multiple accounts, created a new profile and reset game settings. Opened EBR-115982 as well for the issue, but was closed by the bug hunting team. disregarding, you mean? 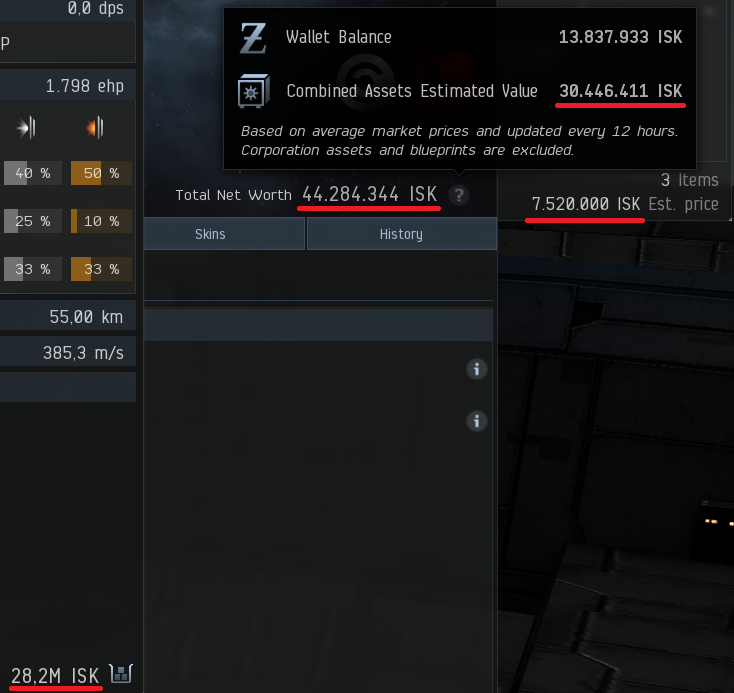 I take it from the picture that your net worth should be 28.2 mil ISK for the ship + fittings + 7.52 mil ISK for the cargo + 13.8 mil ISK wallet = 49.52 mil ISK or so, but instead it's saying 44.3 mil ISK? My three main accounts lost 4 to 5 bil ISK (each) in net worth between April 25th and April 30th... I didn't lose any ships or sell anything during that time period. I have no idea what in their assets dropped by that much value, but I can only assume some market values were adjusted (downward) all at the same time one day. But anyway, I wouldn't worry too much about it being off by a few mil. It is only estimated asset value and doesn't even try to take into account BPO/BPC value. This was only a screenshot to prove that something was definitely off. What I should've shown is that the ships value is afaik not counted at all. I had a lot of loot in station that I didn't include in the screenshot and without the ships value, the estimate is pretty accurate. I'm pretty sure the new calculator completely disregards ships values.